The Democrats’ obstructionism in the immigration debate will hurt them in the 2018 midterm elections, says House Majority Leader Rep. Kevin McCarthy. 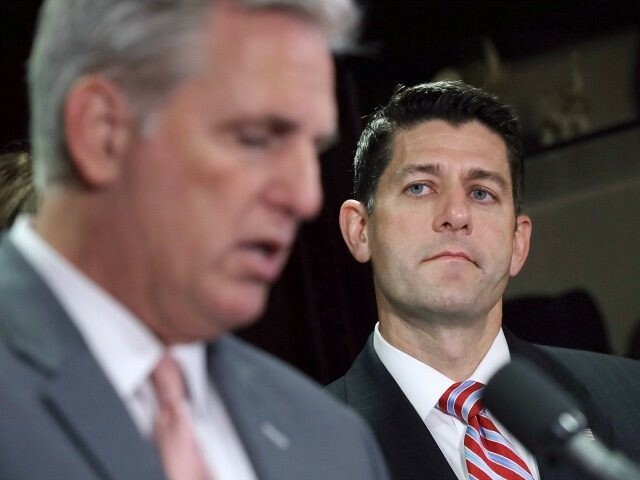 McCarthy is trying to extract political advantage from the deadlocked immigration fight even as GOP leaders and some White House staff are still trying to get unified GOP backing for a modified version of House Speaker Paul Ryan’s amnesty-and-reform bill, said Jessica Vaughan, policy director at the Center for Immigration Studies. “There are different factions within the administration” and the GOP caucus, she said. This week, Ryan and his allies are still trying to get additional GOP votes for his amnesty-and-reform bill, which was slated for a Thursday vote. Ryan and the leaders canceled that vote because Ryan’s bill was heading for a humiliating rejection and fewer votes than the bill drafted by Rep. Bob Goodlatte, chairman of the House judiciary committee. GOP leaders are working behind closed door to raise the extra votes by adding sections that would require companies to use E-Verify when hiring employees, and by creating a new guest-work program for low-tech farmers, such as dairies and apple growers. The E-Verify program is supported by populists and opposed by business groups. The guest-work program is pushed by the agriculture sector. But McCarthy’s focus on the Democrats’ pro-migration stance undermines that closed-door strategy, Vaughan said. McCarthy’s statements echo President Donald Trump’s recent Tweets which argue that the GOP should forget about getting Democratic support for a reform bill and instead should pin the blame on Democrats during the November election. House Republicans could easily pass a Bill on Strong Border Security but remember, it still has to pass in the Senate, and for that we need 10 Democrat votes, and all they do is RESIST. They want Open Borders and don’t care about Crime! Need more Republicans to WIN in November! It’s very sad that Nancy Pelosi and her sidekick, Cryin’ Chuck Schumer, want to protect illegal immigrants far more than the citizens of our country. The United States cannot stand for this. We wants safety and security at our borders! So that is really where I look at it: Can we move this [Ryan] bill forward and make it law, and then when you get in to the Senate, you have the challenge with the Democrats there. They are holding everything up, but we’ve got to solve the problem. They were in the majority all the time [before 2017] and did nothing … We proposed solution after solution, and we will continue to work … Look at what the Democrats have done when it came to tax reform … Not one Democrat voted for that bill either. If he’s trying to convince Democrats to go along with [Ryan’s bill], that’s not how you would do it. You would be doing things behind the scenes, not trying to shame them in public. It looks like he’s accepted it will not pass, and he’s going to use that for political advantage and to salvage something from this episode that will be of political benefit to the Republicans. The leadership seems to be maneuvering to get more support for the Ryan bill so that can be passed [but] there’s no point in doing that unless they can send it over to the Senate …. Why bother? They’ve had an immigration vote now, so there’s no need to do another one unless you want to get it passed. The Ryan strategy is a threat because any bill that would emerge from the Senate would be far weaker than any bill passed by the House because it would have gotten approval from at least 10 Democratic Senators, she said. That is not geting a lot of attention. The media and the Democrats kept calling it an extreme bill yet it is actually the view that represents the view of most Republicans — 193 of them — which is more than the Ryan bill could have gotten.